As soon as Katie saw the pattern in the fabric store, she knew what she was going to be for Halloween: A Steampunk Lady. Unfortunately, the fabric store was out-of- stock of the pattern so we had to figure out something else. 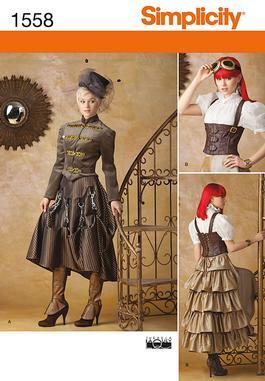 A few weeks later, I was in Joann's and spotted the Steampunk Costume pattern in a display — and it was 40% off to boot! I picked up the fabric, the pattern, and the interfacing and we started on this adventure in sewing. Katie has been wanting to learn to sew and I have almost forgotten how to sew. Years ago my grandmother taught me how to do everything from put in zippers to add darts to use a serger. This pattern was going to call upon all of that know-how and also rely on me to remember how grandma taught me to sew so I could teach Katie. First. I had Katie cut out all of the pieces of the pattern and then identify which went with which part of the costume – there were two full costumes in the pack. We took apart the goggles and spray painted them copper and then distressed them with various acrylic paint. I made a band for the top hat that matches the skirt and wrapped it with tulle, securing that in place with a stick pin. 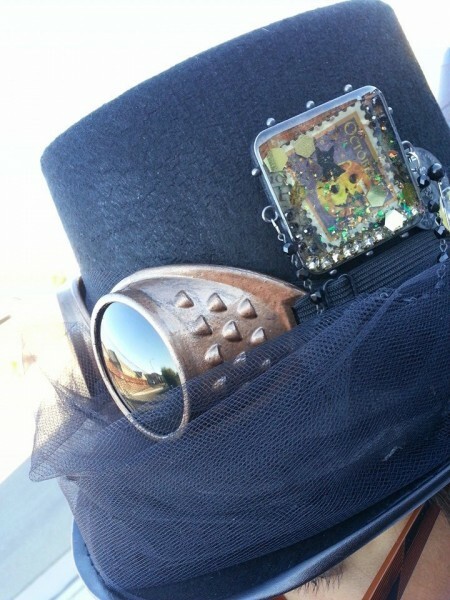 I added a Halloween themed ICE Resin bezel with Graphic 45 paper to the hat as well. And now she wants to learn how to sew even more. Yay! So stay tuned for more of our sewing adventures. Do you ever make your costumes for Halloween? Or sew your own clothes? I would love to hear more – and please share links in the comments if you do sew. This is fabulous-time to warm up my sewing machine for next year.